While reading the Bible, you will find many names or titles given to Jesus. His Great Name: Jesus (Volume 1) is a 13 day study of a few of those names. 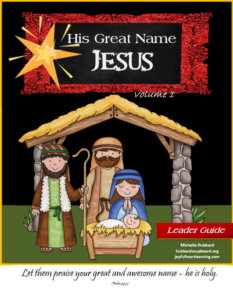 During this study, upper elementary and middle school students (and younger siblings, if desired) will follow the birth of Jesus chronologically through Scripture readings, learn the meanings behind the titles and names given to Jesus, attempt to relate the spiritual truth learned about Jesus to their own lives, copy and memorize Luke 2:1-20, and sing related hymns of praise to Jesus. 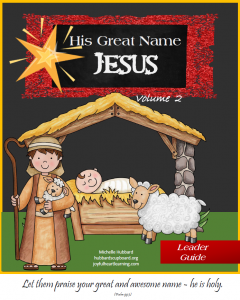 This study, His Great Name: Jesus (Volume 1), pairs nicely with Celebrating Christmas (which is designed for younger children and contains hands on crafts and activities while memorizing Luke 2). Older students using this study may desire to choose some crafts from Celebrating Christmas as well. Don’t worry if your child has already learned Luke 2 through Celebrating Christmas. This first volume of His Great Name will serve as a review and a bridge between the two types of advent studies! Additional Resources: Names of Jesus Word Search, Names of Jesus Crossword, Coloring Sheets, I Have Who Has? review cards, etc. His Great Name: Jesus (Volume 2) is a 15 day study of some of the names and titles held by Jesus. During this study, upper elementary and middle school students (and younger siblings, if desired) will get a big picture overview of creation, sin, God’s plan for redemption, the birth of Jesus our Savior, His death, burial, and resurrection, His promise to return, and the need for our continual growth in Christ. They will also learn the meanings behind the titles and names given to Jesus, attempt to relate the spiritual truth learned about Jesus to their own lives, copy and memorize John 1:1-18, and sing related hymns of praise to Jesus. Please note that although this study is Volume 2 of His Great Name: Jesus, it can be used before or after Volume 1. It is independent of the first volume. Additional Resources: Names of Jesus Word Search, Names of Jesus Crossword, I Have Who Has? review cards, Light It Up Review Game, etc.